Posted by Rob Schaerer on Monday, November 17th, 2014 at 3:56pm. 8239 Lindsay Ln. 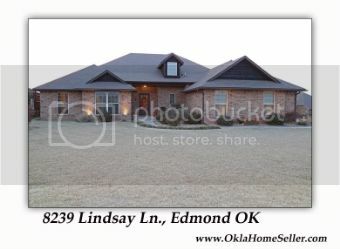 Edmond, OK Just Listed! Half acre corner lot with a storage building! Gorgeous wood floors in all the bedrooms and one living area storm shelter, covered back patio, and a 3 car garage. 2 Living areas and one is completely open to the kitchen. Large master bathroom with a corner jetted tub and large separate shower. Could be a 4 bedroom with a study! Neighborhood park, and pool!